Jockey Damien Oliver says Krone travelled well in blinkers for the first time to win at Rosehill. 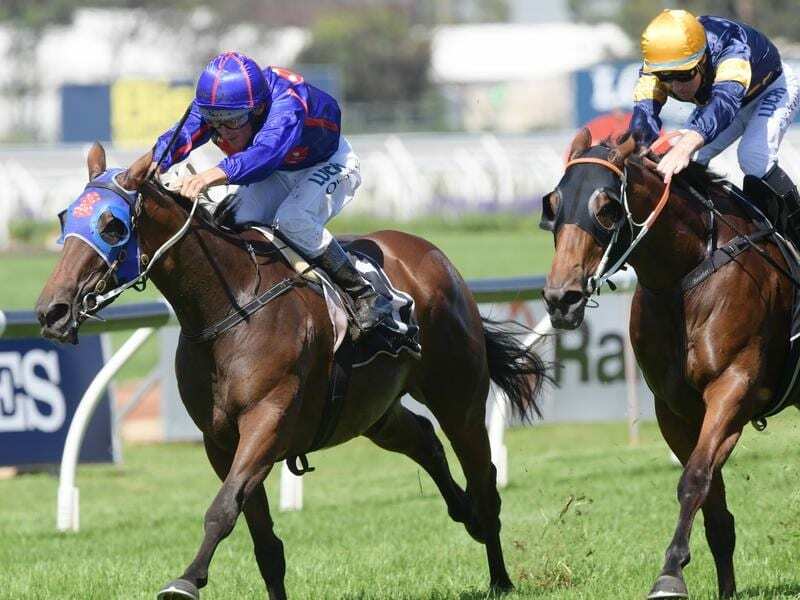 The decision to bring Victorian three-year-old Krone north for Sydney carnival targets has been rewarded, with the filly finishing well to take out the Listed Darby Munro Stakes. Having her second start this autumn for Melbourne trainer Mick Price after doing her earlier racing with now-disqualified trainer Darren Weir, Krone had blinkers on for the first time in Saturday’s 1200m race at Rosehill and reeled in the frontrunners late. Wild Planet ($17) finished a neck away second with another half-neck to Classique Legend ($2 fav) third. Krone, who finished fourth to stablemate Anjana first-up at Flemington, was sent out a $21 chance but Michael Kent Jr, who has recently joined the Price stable and will soon become Price’s training partner, said they went in with confidence. “It’s only been two weeks since I’ve been working alongside Mick so I certainly can’t claim it,” Kent Jr said. “It’s a big team effort from the staff at home and of course Mick Price who has done a lovely job of managing the filly. “She ran so well down the straight first-up and you look at her form card and twice she’s been beaten three lengths by Mystic Journey and she was also second in the Edward Manifold Stakes last spring behind Amphitrite. Krone is expected to remain in Sydney for more autumn targets for fillies in the coming weeks. Oliver said Krone travelled well in the blinkers with a strong pace up front. “I wasn’t sure if I was going to pick up the leaders at the end but she was strong to the line and the others were just tiring on their run a bit,” Oliver said.